So far, what has been presented about Roadcraft here on this site has been educational and thought provoking. It is being looked at by some as a 'foot in the door' within the United States of a largely UK system of 'thinking' (mindset) and behaviors and, I confess, I invited just that. But along the path there have been some bumps that are beginning to concern me and I think it is time that we face, and correct, some brewing credibility problems with the program as it's being presented. The first inkling of a problem was when the principal proponent and spokesman for Roadcraft here began using the phrase 'completely safe' when describing a vehicle passing maneuver. That phrase is absurdly inappropriate for this site as it declares, without qualification, that some aspect of riding a motorcycle - in particular a maneuver which can turn deadly in the blink of an eye - is without risk. When challenged, the writer recognized the issue and declares that the 'point was taken' in order to move on. Shortly thereafter the phrase was used again, and as you would expect here, it was challenged again. This time the writer says he used it to mean something akin to a 'gray' rather than absolute, and then decided that the problem was not the use of the word, but rather the 'litigious society' of the United States. The impression left was that Roadcraft is a catechism that is inflexible and presumed correct in total so that instead of being flexible in its presentation (by using the word 'relative' instead of 'complete') it would be up to the reader to understand the 'gray' intent of the phrase. Next we have the fact that the vast majority of readers here are NOT members of the site. They are people from all over the world with an interest in motorcycle safety (at least an interest in what we say about motorcycle safety). A good many of the posts here on Roadcraft, in the beginning, seemed like platitudes without detail. That detail, it was asserted, was contained in certain Roadcraft documents that would be made available to anybody who provided their e-mail address - not to this site, but to Nigel. Since this site will not provide its member's e-mail addresses to anyone, the vast majority of readers here are unable to send their e-mail addresses to Nigel and I will not allow personal e-mail addresses to be posted in the clear as that will result in those e-mail addresses becoming part of the mega-spammer's mailing lists. A better solution, by far, would be to post relevant parts of that documentation on the site. In that way, ALL readers here, members and the public, could follow the discussions that began after those documents began being sent to 'subscribing' members. Instead, what has happened is that a Roadcraft mailing list has begun. And it has been used to take discussion away from this site and out of view of the public. Originally, that mailing list was to exist in order to distribute documents. Now there are back-channel discussions going on that go around this site entirely. A recent discussion there, for example, is about the use of 'complete safety' instead of 'relative safety' - and I am here serving notice that a back-channel is NOT the way to influence what is acceptable material on this site. THAT activity is anathema to this site. It serves ONLY to benefit a few and it is controlled entirely by the Roadcraft sponsors. I will provide an example of that behavior shortly. The catechism continues on-line here with a recent discussion about 'limit points'. Cash points out that while the concepts presented have merit, they seem to be presented with such a narrow perspective that in the real world of riding it would be a disservice to the rider (it would be dangerous) to focus that narrowly. And, at the same time, the discussion about 'limit points' seems designed to encourage high speed riding on public roads. Such concerns have been ignored by the Roadcraft proponents here. As part of the set of documents distributed by Nigel to the few readers here who sent him their e-mail addresses was a page of diagrams that were designed to explain under- and over-steering. Nice, relatively simple, diagrams - but one of them had been constructed with obvious errors. I sent Nigel a courteous note explaining what the problems were with that diagram - to Nigel, not to the mailing list. In response, Nigel elected to send a notice to his mailing list that included my personal e-mail to him about that diagram. His response to me was that he felt that the diagram was perfectly adequate to meet its objective of explaining under- and over-steering and that my concerns were both 'right and wrong' along with a picture of a race car in full drift mode on a race track. Now there is one topic that will never be allowed to become part of this site - racing. The idea that racing and safety have much in common is a joke, to my mind. In any event, I responded with an invitation for Nigel to reconsider his defense of the original diagram and explained why. Before we go there, I'd like to show you the original diagram. My concern was that the two vehicles represented absolutely no difference in behavior as a result of the differing slip angles shown. That if the vehicles were apparently turning to the right, the front tires should be pointed modestly to the right. The effect of the slip angles should be demonstrated with an actual direction of travel line. And, the representation of centrifugal force should be corrected as it it perpendicular to the direction of travel, not the plane of the vehicle. In response, I was told that the front tires COULD be pointing straight ahead (yes, if in full DRIFT), the issue with the force line was ignored, and a statement was made that he had passed my comments to a lecturing professor friend of his. In other words, he knows his catechism quite well and in his mind that diagram serves its purpose quite well, thank you very much. I sent him a diagram that I proposed as a substitution that was certainly more correct than his and which actually demonstrated the concepts and behaviors of under- and over-steer resulting from differing slip angles. You will note that once again he ignores the centrifugal force line inaccuracy. Well, I don't care whether the Roadcraft uses my offered diagram as a substitute for what it currently uses or not. What I do care about is accuracy. And attitude. It would appear that Roadcraft is being presented in catechism form - without the slightest concern about accuracy, or willingness to accommodate the audience it is being presented to. The spokesman for Roadcraft has all the answers and cannot be bothered to hear anything that deviates in any way from his reality. I am sorry to say this, James, but this whole thing is getting blown out of all proportions, in my view. The point about 'complete safety' was qualified and, at least over here, that phrase is regularly used with the clear understanding that there are certain possibilities which could happen but, which are so far down the risk grading that they do not need to come into normal driving plans. A particularly factor what what has come to be known as the 'critter factor'. This can obviously vary according to the region one lives in and therefore, if the risk probability is higher than 'a remote possibility' then it might have to be brought into the driving plans. So, as point one, that escalated out of control whilst, of course, being right in principle. Such a phrase is comparable to 'if you don't think it is safe, don't do it'. If the 'complete safety' parameter as you are interpreting it was applied, then we would never do anything, because no action could be considered as safe. The point about the mailing list aind, more importantly, that it is a (to paraphrase) devious device to have discussions which should be on the forum, is also unfair. You are dealing with techniques which, if done properly, will certainly reduce vulnerability to crashes by a large margin; that is well proven. As such, an considering those ideas going onto new ground (the States) where the response to them would be unknown, it makes perfect sense to tap the brains of a core group of people as we go along. No, at the moment I certainly do not plan to put things, such as the overtaking technnique openly into the public domain becasue I don't think that would be a responsible action on my behalf. If people use it improperly they will more readily cause death or injury whilst, if used properly, the idividual will be measurably safer, both for themselves and for others in their overtaking technique You need to let people have it individually and then, if necessary, monitor that with them. Just to clarify, there is no alternative discussion going on behind the forum's back. I circulated your proposed modification to the mailing group because I felt they needed to see that this was becoming overly pedantic. That apart there has been no, and there is no, 'discussion' going on. On limit point I am afraid you have picked up the wrong end of the stick. It is merely a device for accurately assessing the speed of entry, progress through and exiting a bend. Don't forget many crashes, at least over here, are caused by in accurate assessment of speed for bends. In it self it has nothing to do with making fast progress. I know that you are very concerned not to have anything on your site which relates to racing. I too believe that racing techniques are not for road driving or riding and there is too much of it happening over here in the UK. Futher, many so called advanced driving courses are run on race tracks with race orientated instructors giving, effectively, race lines through bends etc. I am absolutely in agreement that these are not good for road driving/riding and give completely the wrong impression, and possibly dangersously the wrong impression. 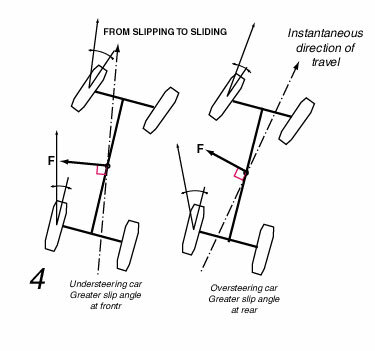 Having said that, when looking at the mechanics of how a vehicle behaves (slip-angles, understeer and oversteer being a good examples) then there are illustrations and images from that area which are useful. The term 'clipping point' comes from racing, but that is merely used to define the point at which the vehilce (or bike) comes closest to the inside of a curve. You talk about accuracy but the term often used, 'late apex' is inaccurate. The apex is the centre point of a bend and that doesn't change, so you can't have a late apex. You can have different points at which the vehicle comes closest to the inside of the bend and the term 'clipping point' is just as useful in road driving as it is in racing to define this. I would recommend both Paul Frere's book on Sports and Competition Driving and Honneger's Book on High Performance Driving as items for better understanding the physics of vehicle behaviour and the various ways of dealing with bends; that doesn't mean you have to be going fast, it just gives depth to your (that's the generic your, by the way) understanding. With respect I think you need to understand the difference between a conceptual illustration, which is sufficient to generate a good basic understanding of the subject in hand and a more technical and, therefore accurate, approach. A conceptual illustration will do the job but does not need to be precisely accurate, per se. I feel you have over complicated the matter by making a big issues over the way the wheels are facing. Paul Frere's book, whence the illustration came is highly respected (and also technical in it's expalations) and if it good enough on that basis it is good enough for me. I'm afraid, James, you have become very hung up on this thing about the accuracy of a particular illustration, for one, but seemingly overlooking the greater possible safety benefit which the information in Roadcraft provides. I studied the subject in depth with police driving instructors in the 1970's, went on to do the BSM High Performance Couse, and have taught the principles I learned for over thirty five years. In that time I have had plenty of time to find anything which was unsound or, just pedantic or, did not contribute to safety and throw it out. So, yes, I do believe very much in what I promote. Call it pedantry, if you like, that's up to you. A catechism was used by the Catholic Church as a substitute for reading the source document. The idea that it is inflexible is absolutely incorrect. The intent of the source document is that it IS a flexible document that can be applied to all situations. Let me take this quote from page 29. "As the with other skills in Motorcycle Roadcraft, you have the responsibility using the system actively and intelligently." Roadcraft is actually the antithesis of a catechism. It uses specific situations to develop root concepts that can then be applied to other situations. The situations used by themselves are simple and point out specific hazards. It's up to the rider to combine these skills into the big picture. This is specifically addressed in Roadcraft. "Hazards come singly and in clusters; they overlap and change all the time." Any idea that it's a rigid system is just wrong. Take overtaking. The underlying concept that a person "pauses" in the oncoming lane before progressing is a simplification of the mental process. It is described and demonstrated as a smooth maneuver. The concept is one is mentally prepared and able to move back in when they move out. I had just a situation yesterday. As I moved out to pass, a view opened up of the other side of the road which revealed some deer crossing the road. I pulled back in and stopped. As to off board communications. I'll combine two thoughts here. Yes, I have communicated with Nigel by email to clarify points before I posted them on the board. I also recommended against the use of the words "absolutely safe" as it has a different connotation here than the one he is used to using. There have been times I've communicated with you and other riders before posting something or to clarify a point which wouldn't be of interest to other riders. However, safe, like pregnant, is an absolute term as defined by the Oxford dictionary. But in common usage it is different. So, I recommended terms like "reducing risk" or "risk management" which would retain the idea that all riding contains some hazards. American training is largely skill set based. If one can only do a better U turn or figure 8, brake more effectively, swerve better, put two feet down at a stop sign, etc. they will reduce risk. These skills are necessary as an end game. But crashes start well before the impact. Many times, the actions that result in an endgame maneuver that results in a crash take place 10 to 20 seconds before the impact. Roadcraft addresses this time period. The other skill sets are assumed to have been taught in previous courses. Afterall, it's not sold as a complete book to motorcycle riding. I've introduced 4 topics from Roadcraft. Roadcraft is WORK. Only ONE rider indicated he practiced observation at intersections while in his car. Nobody mentioned anything about practicing the skills. One rider suggested that learning new skills might be dangerous. (Apologies if I misinterpreted.) There is nothing in Roadcraft that suggests one ignore the big picture while momentarily noting small parts of the picture. In fact, there is a picture on page 16 that addresses this issue. Sorry, but your critique reminds me a lot about people who say "You think..." and then criticize me for what they say I think. "The catechism continues on-line here with a recent discussion about 'limit points'. Cash points out that while the concepts presented have merit, they seem to be presented with such a narrow perspective that in the real world of riding it would be a disservice to the rider (it would be dangerous) to focus that narrowly. And, at the same time, the discussion about 'limit points' seems designed to encourage high speed riding on public roads. Such concerns have been ignored by the Roadcraft proponents here." This is simply WRONG. The limit point will always dictate a speed well below the physical limit. In almost all cases it will dictate a maximum speed at the speed limit, including advisory limits. MANY times, it will dictate a speed below the speed limit. You have redefined the word focus and suggested that it is a narrow focus. The word you should be using is fixation to define what you mean. Yes, Roadcraft does use the words focus and concentration. What word would you use to describe consciously looking at an area of the road without losing sight of the big picture. I'm the one who introduced limit points. You should know by know I'm a speed limit rider. I use the term "lethargic" to describe my riding style. The following phrase is repeated many times throughout Roadcraft. "One must always be able to stop safely on their side of the road on the road they can see." There is a section in Roadcraft that addresses "red mist" specifically as it applies to Police riders, but can be applied to ANYONE. It emphasizes keeping the ride safe as the FIRST priority. James, you defined Roadcraft as an "Inflexible catechism." It's not. You describe it as "having all the answers." It doesn't suggest that. You describe it as "deaf." Yes, I'm deaf to criticisms not based on what Roadcraft actually is. If you had the book, or if you tried the techniques with the mindset of learning the root concepts from them, then I'd listen to objections with a completely open mind. However, your critiques are generally based on what Roadcraft is NOT. Don't use the words "absolutly safe." Easy enough. I don't as I understand your objection. To describe Roadcraft as something out of reach of the general rider - absolutely correct. Only one rider has stated he even tried the techniques. Because of this, I had already decided a couple days ago that the average rider is NOT interested in learning advanced simple techniques and I would no longer introduce new topics unless the old generated some discussion as the audience is not ready. "Advanced" and "Simple" may seem like an oxymoron, but in the context of Roadcraft they are not. But most will not put in the effort to improve past some plateau at which they feel safe as they don't see the need. They'd rather go ride....sounds like a good idea. My use of 'inflexible catechism' refers to how it is being presented here, not Roadcraft itself. The functional audience is limited to only those who have joined a mailing list as the documents will not be allowed (by Nigel) to be posted here for our millions of readers. Nigel does not seem to be flexible enough to use the word 'relative' (or something equivalent) instead of 'complete' because in the UK they seem to 'get it'. A graphic is distributed to the mailing list which purports to 'conceptually illustrate' and provide a good basic understanding of the subject at hand. The subject at hand was under- and over-steering. The diagram does not 'conceptually illustrate' that subject nor does it provide a good basic understanding of it. Indeed, what it does, redundantly, is show what slip angles are, but not under- or over-steering, and it contains illustrative errors. Instead of recognizing the errors in it and its lack of demonstrating anything about the subject, it accepts the errors and justifies its use because a noted expert provided it. That's inflexibility, rationalization to continue a catechism without concern for accuracy, and a public disservice to Roadcraft. The title of this thread is "Inflexible catechism - all answers, and deaf". It refers to material being presented here, not Roadcraft, just as when I used it earlier it referred to a representation of what the BRC is and how it should be taught by a member, not the MSF. Nigel's response in this thread suggests to me that the title is spot on. Sorry you would rather see it differently, but that's fine with me. My mother used to have a saying: "Don't stir up old sh&&, it stinks." Nigel had stopped using the word absolute days ago. Why bring it up again? The functional audience is somehow hidden? I have not expressed nor seen expressed a single concept in private conversations that has not been expressed here. There IS NO functional audience as NOBODY is participating. It's like giving a concert where nobody applauds. The musician's performance will suffer with an audience that doesn't seem to care. Students can only effectively ask "Why" after trying a skill. For instance on limit points, a student might point out they lost awareness of obstacles on the road while practicing it. The instructor might say something like "try it on more gentle curves only to the extent you can maintain situational awareness." It seems to me you are the one being inflexible continuing to attack Roadcraft based on what you perceive it to be rather than what it is. That diagram is not even a part of Motorcycle Roadcraft and is apparently a side discussion. In the interest of accuracy, I'd suggest changing the title of this sub-thread, or perhaps even deleting it. Does Roadcraft claim to have "ALL the answers" or "relatively all the answers?" Is it Inflexible. Not at all, yet you suggest it is. Keep in mind those passing through might take your opinion as "gospel" and not delve into the truth. When they move on, they will miss out on one of the best concepts I've seen. Is it "completely unable to hear?" Not at all. I see Nigel addressed each one of your objections in a thorough way. It's NOT necessary you two agree. It IS necessary that he change some vocabulary for the sake of peace and clarity. He had also STOPPED using the word absolute and didn't bring it up previous to this. If you take the effort to buy, read, and practice Roadcraft you may have a different opinion. If you do this, try to get at the root concept the author is trying to illustrate. You will know you are spot on when you suddenly find a concept like the limit point applies in every situation there is a hidden view. When some emerge that express an interest in learning Roadcraft instead of petty arguments, I'll revisit the Roadcraft thread. Until then, participation will just make me upset - a mental state one is specifically warned against in Roadcraft - notice I didn't go for that ride. One more time - and the last time - I have never, ever, suggested that Roadcraft has all the answers as it DOESN'T. Neither do I. The title does NOT refer to Roadcraft itself. Roadcraft doesn't present itself with a superior attitude - one that cannot hear criticism. It doesn't stoop to explaining the Kings's English as a way of shifting the conversation away from substance. Nor does it tell us about its mother's sayings, for the same reason. Got that persepctive clear in your mind now? The restricted audience has to do with what is presented HERE, not in the back-channel. Our guests CANNOT effectively participate in that they do not have access to the material that is being discussed. Roadcraft doesn't present itself with a superior attitude - one that cannot hear criticism. Got that persepctive clear in your mind now? ALL the material is available in the book which is available for about $12.00 including shipping. Is that too much for any rider to afford? If people had the initiative to buy the book, page numbers could be referenced instead of sending emails. We do the same thing with "Proficient Motorcycling." It's more or less assumed that those genuinely interested in safety will get the book. Now, let's drop thread and focus on something like limit points or lawn furniture. If you have a specific objection in those threads, express it and I'll address it with my perceptions which may be wrong. But please post after trying it for a good period of time. As I've found many times with my own riding, how it looks on paper is often not how it looks on the road. You might just find they expand your big picture outlook. Or you might decide they aren't for you. As it says in the beginning of the book. It's not for those who won't practice. In fact, these types of people would be excluded from the course. Thanks for feeling it appropriate to tell the writer of most of the code we use here what 'thread' means, even though you are wrong. A 'thread' is a 'Topic'. A topic is part of a forum. The forum we are dealing with is Roadcraft. Topics are relevant to a forum. As to requiring a member or guest to buy something in order to feel that they can participate on this NON-COMMERCIAL site - think again. The forum (Roadcraft) is close to becoming history, and if the readers here feel that it is useless without a required purchase of some kind, it will cease to exist. Now, let's drop thread and focus on something like limit points or lawn furniture. You are free to start another thread of your choice, but I do not take instructions from our members as to whether a thread survives or not, thanks anyway. Thanks for feeling it appropriate to tell the writer of most of the code we use here what 'thread' means, even though you are wrong. A 'thread' is a 'Topic'. A topic is part of a forum. The forum we are dealing with is Roadcraft. Topics are relavent to a forum. The forum (Roadcraft) is close to becoming history and if the readers here feel that it is useless without a required purchase of some kind, it will cease to exist. What the author means is irrelevant. What is important is the meaning the reader or listener gets. Isn't that the whole point about the term "absolute?" (A discussion I agree with YOU on.) I take the thread title of Roadcraft and the sub-title as a declaration of your opinion of Roadcraft. Had another member not in an authority position started this thread, I'd have no objection. Remember, people seldom get past headlines. It's YOU who brought up the idea that Roadcraft is useless without buying the book. A perfect example of changing what I said and then attacking me for what you said I said. What I DID suggest is it's useless without practice. I took the approach of explaining some concepts in a way that could be generally understood without the book hoping they would generate discussion, practice and mastery of the techniques in a safe way. Rioguy has left the building because "What the author means is irrelevant". At this time I would rather, if it is possible, let the dust settle from this little fracas and continue with the forum as is.Things are always difficult when they become personal and, in my view, it is never a good thing to have direct and personal confrontation/s on a forum. It just sends out negative vibes. All of that should, ideally, happen discreetly and out of sight of the main membership. Being involved in the forum currently suits my time availability. Having a separate website might happen but it would, as mentioned, likely consume much more time. At the moment I suggest we just see how things run here. I am profoundly disturbed by this topic, and by its result so far. I am deeply appreciative of this site, and very grateful for its existence. I fully appreciate that it is wholly owned and controlled by James, and have greatly admired the way it is administrated, and its rigorous moderation. I don't know whether it's just my impression, but I think the site has changed its character a little in the last six months or so. I think we have had more 'advanced' riders ready and willing to discuss 'advanced techniques' on the forums. Whether or not my impression that the site has changed is true, the very fact of discussion of 'advanced techniques' has, IMO put some strain on the integrity of the site. As James points out, the site is heavily visited, and there is a sensible assumption that many of the visitors are relatively inexperienced riders. A major aspect of the 'integrity of the site' is that James will rightly not allow 'bad' information to persist unchallenged and uncorrected, and that techniques which might be employed by 'advanced riders' in a safe manner, but which might well be dangerous for new riders to employ without experience, or training, or the right mindset, are either not discussed, or heavily and explicitly qualified if they are discussed at all. This makes it hard for 'advanced riders' to hold productive discussions here on those techniques, and to some extent, decreases the benefit that 'advanced riders' can get from the site. While I am still learning from this site, I honestly feel that I could learn more from discussions that should be of limited availability to the general public, at least as to being conducted on this site and, in effect, having James's 'imprimatur' or endorsement as being good safe advice for new riders. I have wondered whether it might be possible, or even advisable, to have a restricted section of the site, where such discussions could take place. I had not yet raised the idea, and from some of James's comments above, I think it may be contrary to James's wishes for the function of his site. The introduction of some serious discussions of Roadcraft to the site has thrown this (IMO) growing issue into high relief. I was originally trained using Roadcraft, in the UK, back in the late 60's. I recently purchased an up-to-date copy of Roadcraft, inspired by the recommendation on this site, just as I earlier purchased David Hough's Proficient Motorcycling on the recommendation on this site. I have expressed my concern a number of time on this site, on the lack of any 'advanced training' in the US that is not track based. As rioguy pointed out, it seems that all American training courses are 'Skill Set' training, rather than a 'Systematic Approach' training. Yet, it seems to me, we have been consistently advocating that riders must 'internalize' skill sets as they learn them and develop a considered, thoughtful, and integrated approach to riding on the street. It is my opinion that Roadcraft is just such an approach. A major problem, however, (IMO) is that most Americans have never been exposed to such an integrated approach, or even to the concept of a 'System' of driving or riding. Another major problem (again IMO) is that Roadcraft (the book) is actually the manual designed to be used in a lengthy and intense teaching process. We have access to the book, but not to the teaching process. In an off site, and personal, email to Nigel A a few weeks ago, I expressed (amongst other things) my personal opinion that there were two possible outcomes of introducing the topic of Roadcraft to this site. 1) After rigorous critical analysis, some of the specific techniques in Roadcraft would be adopted into their 'bag of skills' by some of the members. 2) The idea of a 'System' of motorcycle training might take hold, and possibly lead (finally) to the gradual introduction of Roadcraft in the US. I did not consider this one particularly likely. My estimate of what in fact happened is that some few of us informally adopted the idea of a 'System' of training, and thought we were discussing that, but all the discussions involved specific techniques, which were (quite reasonably0 taken in isolation by those of us who had not adopted the idea of a System. Naturally a discussion between people who were making very different assumptions did not go well. I'll leave it at that, for now, until I see how this lengthy commentary is received. Wow, was this thread *really* worth losing a member who has contributed as much as Rioguy? I gotta say, I'm quite surprised. Excellent post Meromorph! I have read the postings related to RoadCraft with interest. It certainly appears to be a more advanced program than anything we have available in most areas of North America. I particularly like the aspect of taking the training beyond the classroom, and the parking lot out onto the actual roadways, in supervised group rides. I, as well, have concerns about some of the teachings which I feel may be appropriate for "police riding" but totally unacceptable and downright dangerous for the general motorcycling public, regardless of experience. I don't know to what extent the threat of Litigation and compounded Insurance rates exist in Great Britain, but I do think both these aspects are a serious detriment to any similar program successfully taking root in North America. Those two factors alone would make the cost of such a program far too prohibitive for most riders to afford. Although I personally hunger for more advanced training, I find that this site has played a very important role in my riding safely. What is promoted on this site are the sound and proven basics, that once mastered and combined with experience, can be the mainstay for all riders, regardless of experience. Discussion of some aspects of "advanced riding" shouldn't be done in such a manner as to send an inexperienced rider in a direction of learning that would be to their detriment. I would much rather have no discussion of advanced riding techniques on this site, than run the risk of leading even one person astray. Rather than a separate and "restricted" area of this site, a website as suggested by Halsey would be more appropriate. The unfortunate part of it is that it will be difficult to find someone equal to James in dedication and the commitment it would require to create such a site. There is no disputing Rioguy's contribution as a member, although I found him to be lost in metaphysical space at times, I had no problem with him. However, in this thread he has become confrontational and challenging. Once a member takes that road, he can only travel in one direction and that is out the door. I think James was far more tolerant of Rioguy than I would have been, but then I've been known to have a short fuse at times. NA: In the UK all qualified obsersvers (for Insitute of Advanced Motorists) and tutors (RoSPA Advanced Drivers) are coverd by insurance, as are the particular advanced driving groups themselves under a blanket insurance provided by the respective organisations. All of those will be volunteers who give their time freely to help others become safer on the roads. There are also those who train others professionally (such as Nigel Bowers, aka advancedrider) and they will obviously have full insurance coverage for the work they do. NA: This is the perennial problem. Implimenting techniques (such as those included in positioning and overtaking) safely very much requires the right mind-set to do it safely. The 'Red Mist' syndrome as described in Roadcraft has been mentioned as one aspect of wrong mind-set which can dramatically reduce safety and therefore increase vulnerability (to crashes). I have also mentioned that in the D12 programme (twelve drives) overtaking is at D10 and, if by that time the associate has not aquired the right skill set and (most importantly) the right mind-set, I won't even embark on that module. The only thing one can do in the interim is put out a strong proviso (as there is in this forum) to the effect that the techniques are sound but it is up to the individual rider to impliment them safely. And if they are not certain simply don't do it. To be of any use Roadcraft has to be felxible and very practicable. I first became a Roadcraft convert on my first Police motorcycle course in 1978 when I started by Police motorcycle career. After a few years I was back on another motorcycle course , 3 weeks, then my advanced course, another 3 weeks on public roads in the UK - Allowed to exceed speed limits. I then was fortunate to do an Instructors course, another 6 weeks. That is 15 weeks riding and learning Roacraft, front to back. I knew every page, then they republished it and reduced the system from 7 features to 5. It has now been republished again and made more 'PC'. Roadcraft is only a guide line and open to interpretation by all that use it, but what is paramount is the 'system'. I am still using it as I am now training Emergency drivers in Blue Light Training on public roads in the UK. I think the Roadcraft manual itself needs a significant rewrite/translation to be generally useful in the US. The needed changes range from the relatively trivial (but critical) left/right changes, and corresponding diagram changes, through things like double yellow lines from double white lines, and terminology (e.g. Lorry vs Truck; Artic' vs Semi), to the significantly different, and far more variable, US laws, even to the subtle but dangerous differences between US and UK grammar and usage (e.g. A flat statement qualified afterwards is normal UK usage, but not US usage; to US English speakers it damages the credibility of the originator). Worse, as I previously commented, the Roadcraft Manual is intended as an adjunct to long and extensive training, which itself assumes prior training and experience. That simply is not (yet) available over here. I've just begun exploring how it might realistically be possible to interest US Police Departments in the benefits of Roadcraft in reduced Police death and injury rates. There are one or two possible approaches, but I expect it to be a long process, particularly in difficult economic times. No, at the moment I certainly do not plan to put things, such as the overtaking technnique openly into the public domain becasue I don't think that would be a responsible action on my behalf. If people use it improperly they will more readily cause death or injury whilst, if used properly, the idividual will be measurably safer, both for themselves and for others in their overtaking technique You need to let people have it individually and then, if necessary, monitor that with them. I quoted the paragraph for context but the highlighted portion is our common ground. Nigel A, you show the proper reluctance to put forth documents that contain concepts whose understanding you feel need guidance. You fear that they might be misunderstood if left to stand on their own without the benefit of mentoring. The concern raised over the use of the phrase "complete safety" and the apparent inaccuracy of a diagram reflects that exact concern on our part. Your values and this forums seem to be very similar. Your goal to increase rider safety through education and discourse are also in line with this forums goals. I feel that perhaps what needs to be worked out is a format that will allow us to move forward. As an observer I believe I see and understand both concerns. I believe that no small measure of the disconnect we are experiencing is cultural. I think there is too much common purpose for us to fail to make the effort to get in sync. This page was generated in 0.71 seconds.